Headache is a common problem and may be associated with other diseases. Headache is not a disease but is a symptom of other brain diseases. Every person suffers from headache at one point of time or the other. There are different causes of headache. Headache may cause discomfort and interferes with the daily living activities. It is important to contact a medical professional if you have continuous headache. It is necessary to determine the right cause of the headache. One can get rid of headache by making changes in the lifestyle and taking some time to relax. There are different types of headache. Migraine headache, tension headache are common types of headache that affect people. Women are more prone to suffer from headache as compare to men. One should take proper treatment for chronic headache after knowing the cause. Any injury to the brain can lead to headache. Excessive loss of blood due to head injury can cause decreased supply of oxygen to the brain and continuous headache. Stress is another cause of headache. People having mental stress can experience headache. Depression is also an important cause of headache. People who are depressed due to some grief or worry can have continuous headache. Stiffness of the neck or cervical spondylitis can also cause headache. Lack of sleep also causes headache in some individuals. Eating improper diet can also cause headache due to decreased supply of oxygen to the brain. Migraine headache is a severe type of headache that may present with other symptoms such as nausea and vomiting. There is excessive pain which is unbearable. Person having migraine cannot stand properly and may have vertigo. Sinusitis or accumulation of mucus in the nasal sinuses can also lead to headache. Sometimes, people suffering from flu or fever may also have headache due to weakness or infection inside the body. Women experience headache during menstruation or before occurring of the periods. Brain diseases such as tumour, meningitis, hydrocephalus, high blood pressure etc. can also cause severe headache. Divya Medha Kwath: This is an excellent remedy for brain disorders. It helps in improving memory. It helps to give relief from depression. It is a natural and herbal brain tonic that helps in improving concentration and gives relief from any kind of headache. It is a migraine natural treatment. Divya Mukta Pisti: This is a wonderful herbal remedy for headache, migraine and depression. People suffering from chronic headache should take this herbal remedy regularly to get beneficial results. 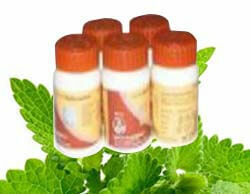 It does not produce any adverse effects when take regularly for the treatment of headache. Divya Praval Pisti: This herbal remedy helps in nourishing the brain cells and also increases the supply of oxygen to the brain. It is the best remedy for people who suffer from migraine headache. It supplies essential nutrients to the brain and gives relief from recurrent attacks of migraine. Divya Godanti Bhasm: This herbal remedy helps in giving relief from headache and other brain disorders. This is an herbal tonic for your brain. It helps in increasing the memory and concentration. It should be taken regularly for getting relief from depression and headache. This herbal remedy supplies essential nutrients to the brain for preventing headache. Divya Medha Vati: This is another useful herbal remedy for brain diseases. It helps in increasing the supply of blood to the brain and is a wonderful remedy for chronic headache. It cures all types of headaches. This is one of the best herbal remedies for headache. This remedy has been used traditionally for weak memory and concentration. One should drink more water to avoid any dehydration. People suffering from migraine headache should drink more water after they have vomited. During headache, you can place a cool cloth on your head to get some relief. Exercise and yoga asana is very useful for the treatment of headache. Yoga helps in increasing the supply of blood to the brain and prevents recurrent attacks of headache. One should proper nutrition to avoid recurrent attacks of headache. Women should eat proper diet during menstruation to avoid headache. Proper sleep is very necessary for getting rid of headache. One should take proper sleep of seven to eight hours. Children suffering from headache should be advised to sit away from TV and also to study in proper light to avoid headache. 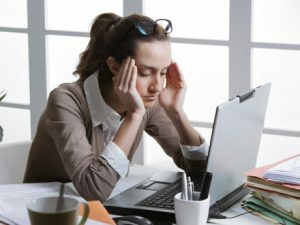 People working on computers should take rest in between to relax and avoid headache due to eye strain. Drinks such as alcohol, coffee and tea should be avoided as these drinks decreases the supply of blood to the brain and may cause headache. Grape juice is a very useful home remedy for the headache treatment. Drink one glass everyday to get rid of headaches of chronic nature. Detoxification is important to get rid of headache. One should eat detoxification foods to avoid headache attacks. Carrot and cucumber juice is also a useful remedy for headache and migraine.